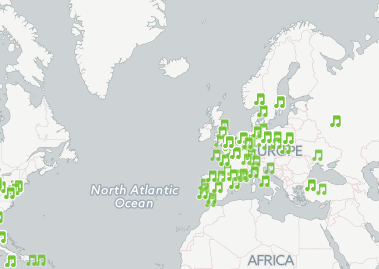 Javier Arce, a developer and illustrator who works at map making site CartoDB, has created a fun interactive map of 7,681 songs about 212 cities across the globe. When you click on a city on the map, an embedded Spotify player will pop up (you may need to have Spotify installed), allowing you to scroll through and play the songs listed on the player. Arce's map is based on the songs listed in the Wikipedia article “Lists of songs about cities,” so there are a few notable omissions -- namely, no “Sweet Home Chicago” or anything else about the Windy City, since “songs about Chicago” has a different Wikipedia article. Republished courtesy of Javier Arce and Ana Swanson.